The Skitter Leaf (ハンボ?) is an enemy found in Pikmin 2 and Pikmin 3 that resembles a leaf. These creatures remain camouflaged on the ground until approached by leaders, at which time they attempt to flee with a cricket-like chirp. They are somewhat rare, usually located in very fresh places, such as near or in water or foliage, but they are not worth defeating or recovering. This is because the leaf they leave upon death, while only requiring one Pikmin to carry, yields only a single Pikmin seed or one Poko. The Skitter Leaf, when it is hiding, looks like a small leaf on the ground, making it seem like it's part of the scenery. When approached, however, it will leap up, revealing feet with a similar pattern to the leaf on its back, and bulgy red eyes. What the stem would be on a leaf is actually the Skitter Leaf's mouth, and due to its small, tube-like appearance, one can conclude that the Skitter Leaf mainly feeds on plant juices. The main "leaf" acts as a cape, which the Skitter Leaf uses to fend itself from predation by flipping in the air and whipping it around. Upon flipping, the creature will also reveal a rounded, yellow abdomen. Swarm it with Pikmin, or toss one directly onto its back; Purple Pikmin work especially well for the latter method, as they will home in on the Skitter Leaf. It has low vitality and can also be easily defeated by leaders. Leaders can be harmed by it, and it will shake any attacking Pikmin off when given the chance, which usually knocks off their flowers or buds. 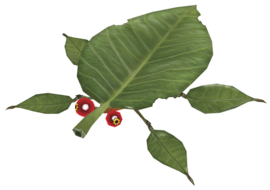 This enemy cannot be petrified when it hides as a leaf, but it can when it is up and active. The creature is much harder to defeat with leaders and reacts quicker to assaults, but remains easy to defeat with one shot on the back. Winged Pikmin are the only Pikmin somewhat ineffective against it, unless they are tossed directly onto its back while resting. The creature can no longer remove flowers or buds from Pikmin. There are rare occasions where one will duck right when it loses all its health, rendering it unable to die until a leader approaches it. The creature being called a leaf is a clear reference to its leaf shape allowing it to blend with the environment. In Japan, its name is ハンボ?. Its scientific name is Rus pseudoarbicans, which has a completely unknown meaning, besides the Greek word "pseudo" in it, which means "fake", likely alluding at how it is a fake leaf. Internally, its name in Pikmin 2 is sokkuri, which is an onomatopoeia for "looks like", once more referring to how it mimics a leaf. Its internal name in the next game is hambo, which is the same as its Japanese name when Romanized, but with an 'm' instead of an 'n'. A Skitter Leaf on the Piklopedia. Artwork of a Skitter Leaf. A bunch of Skitter Leaves in water. An early Pikmin 3 Skitter Leaf lock-on screen. A close up of a Skitter Leaf. A Skitter Leaf shaking Pikmin; notice the abdomen. The upper part of a Skitter Leaf's abdomen. The creature's e-card, #59 (7th blue card). The Skitter Leaf resembles a magnolia acuminata's leaves. In both Pikmin 2 and Pikmin 3, the Skitter Leaf moves very slowly in water, and its animation resembles it attempting to swim. This page was last edited on March 2, 2019, at 19:57.